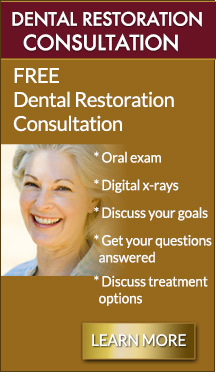 Dr. Nguyen does many types of dental restorations to help you smile again. 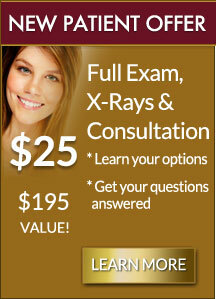 Dr. Nguyen only recommends procedures she believes are right for you. Dr. Nguyen is well-trained and experienced in all aspects of restorative dentistry and knows the right combination of treatments that will work to return your smile back to proper form, function and esthetics. She has taken many ongoing continuing education classes including restorative dentistry at Loma Linda University and UCLA. If you need major or complex dental work, Dr. Nguyen will be able to get it done for you the best way possible. Whatever procedures Dr. Nguyen recommends are the ones she believes are right for your situation. You won’t get even get as much as a filling unless you truly need one. Her main focus is on the overall health of her patients, smile aesthetics and the longevity of the work she does. Tooth-colored fillings are safe and look like you never even had a cavity. 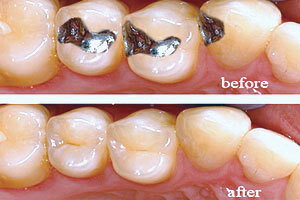 Old silver amalgam fillings can be unattractive as well as possibly not safe because they contain mercury. Dr. Nguyen uses metal-free, tooth-colored materials that are both aesthetic and safe. She will also replace your old silver fillings with new tooth-colored ones if you desire. Dr. Nguyen uses all-porcelain material for crowns so they look just like your real teeth. A crown covers a broken, damaged or decayed tooth. Your tooth is filed down under anesthesia to allow the crown to cover it. Then the crown is cemented in place. Dr. Nguyen uses high-quality porcelain to make your custom crowns. Natural looking and durable, they emulate real tooth enamel. She also utilizes top-quality local labs for the best aesthetic and color-matching outcomes. Dr. Nguyen is well equipped for any type of restoration. She has taken many ongoing continuing education classes including restorative dentistry at Loma Linda University. She will make sure your permanent crown is fitted expertly, painlessly and smoothly. Dr. Nguyen can repair any low-quality, older crowns made from non-durable materials or crowns that have already broken down with all porcelain ones. She will perform a complete examination and evaluate what should be removed and replaced to optimize esthetics and your oral health. We use high-grade porcelain to make durable, natural-looking bridges. 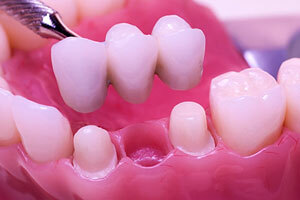 If you have a gap in your smile caused by missing teeth, consider getting a dental bridge. A bridge is a natural-looking dental appliance that’s custom-made to fill that gap while preserving the alignment of your teeth. 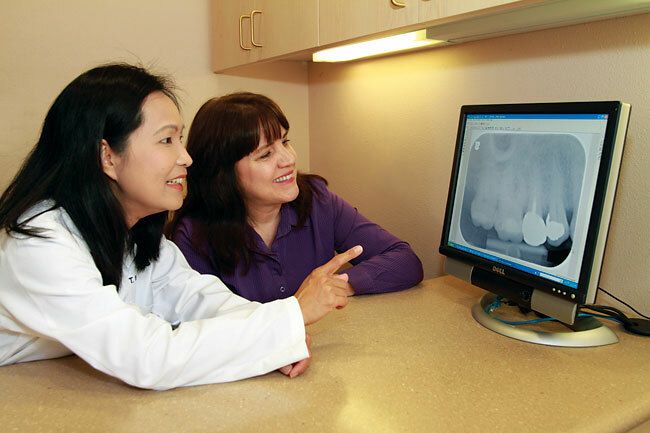 Let Dr. Nguyen bridge that gap in your smile just as she’s done for so many of her patients. A bridge is made of two supporting teeth and one or two porcelain teeth to fill the gaps. Those two supporting teeth can be dental implants or crowned natural teeth. Dr. Nguyen uses high-grade, natural-looking and durable porcelain bridges. She will make sure your bridge looks completely natural, is correctly placed and will last. 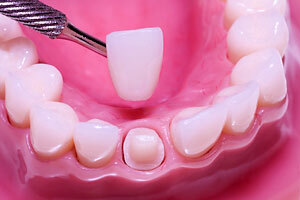 Bridges can be an affordable solution to replacing missing teeth. Even if you have a missing tooth that people don’t often see, getting the gap filled is very important to your chewing function and to your overall oral health. Spaces in your mouth from missing teeth can cause multiple teeth to shift, lead to bite and/or jaw problems and can contribute to gum disease and bone loss, as well. The primary cause of the majority of problems with dentures is a bad fit. Creating a perfect fit is a combination of science and art, a process Dr. Nguyen is well versed in accomplishing. She has advanced training and years of experience in creating custom-fit, natural-looking dentures that will enhance your appearance. She will perform your treatment so you get optimum results, both aesthetically and functionally, making sure your dentures fit precisely to your mouth and are pain-free and comfortable, too. Dr. Nguyen is very experienced in creating dentures that fit right and are comfortable. 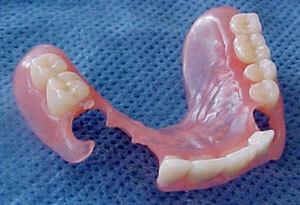 Rather than using metal clasps, no-metal partial dentures are made using very strong, durable plastic clasps. These dentures snap securely and comfortably into place around your teeth. No- metal partials are perfect for most denture wearers. The exceptions are people who clinch or grind their teeth or who have a heavier bite. After teeth extraction there’s no reason to go home without teeth. Dr. Nguyen will fit you with comfortable, attractive temporary dentures until your mouth has healed. An overdenture gains extra support from your remaining teeth. 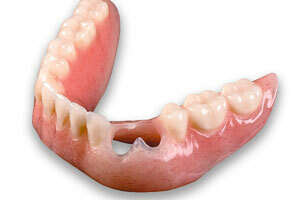 Overdentures are removable appliances that are made to fit “over” natural teeth or implants. It is a complete denture that can also be designed to gain additional support from remaining teeth that have been reshaped or altered prosthetically to permit the denture to fit over them.